Skinwalker tales, like those of El Chupacabras, are not native to the contemporary Anglo-American culture of the U.S., but over the last few decades have been reported more commonly in the southwest by people of all ethnic backgrounds. In traditional Navajo culture, the skinwalker, or yenaaldlooskii, is a dangerous practitioner of witchcraft who wears the skin of various animals, becoming coyotes, wolves, bears, crows, owls, and other creatures, and is thought by some to literally become these creatures. Sightings of skinwalkers have been reported by non-Indians since at least the 1960s, but have become a subject of greater interest since the publishing of Tony Hillerman’s novel Skinwalkers and the subsequent television movie based on it. 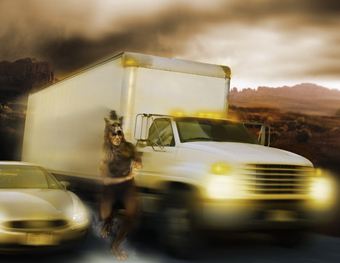 Skinwalkers are usually described as half-human monstrosities who run on two legs—and do so at extreme speeds. A Flagstaff woman claimed that one night while driving across Navajo reservation land at about 60 miles an hour, one of these apparent shape-shifters started running alongside her car, tapped on her window, then darted in front of her car and disappeared off the road. Another man reported a virtually identical experience while driving near Sedona. This type of roadside encounter, which has also been reported around Winslow and Window Rock, is by far the most commonly recorded form of modern skinwalker account. Frequently, they are said to let loose a volley of screeching laughter as they torment motorists. In June 1987, the mutilated body of Sarah Saganitso was found in a rocky area behind where she worked at the Flagstaff Medical Center. George Abney, a professor at Northern Arizona University, was arrested that September and tried for her murder. Part of the woman’s left breast had been bitten off, and the prosecution offered testimony that the bite marks matched Abney’s teeth. The defense countered that circumstances surrounding Saganitso’s slaying suggested a skinwalker-witchcraft murder, including a broken stick left across her neck as well as a clump of grave grass found next to her pickup truck. Abney’s attorneys first tried to implicate Saganitso’s former boyfriend on the flimsy basis that he was a member of the Native American church, but investigation proved that the man in question was at a sweat lodge in Tuba City on the night of her murder. Nonetheless, Abney was acquitted. Did a guilty man go free, or do murdering skinwalkers sometimes prowl Arizona? The Stories on this site are just the tip of the iceberg. 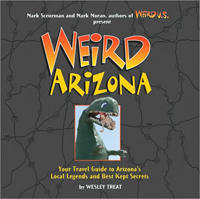 Buy Weird Arizona today!